Cleveland Lavalais ‘21 (above) incorporated audience participation and experimental techniques in his performance on Thursday. Photo courtesy of Jay Corey. The course, entitled “Freedom Dreams: Afro-Futurism and Visionary Fictions,” challenges elitist conceptions of intelligence and interrogates how academia can intersect with liberation. Green uses creative practices and prompts to help students engage collectively with Afro-futurist theory and attempts to deconstruct classroom hierarchies through alternative forms of class participation. The course reads works by black science fiction writers, but also interrogates the compartmentalization of the science fiction genre, reading enslavement and black survival as its own kind of living, real, science fiction and the black radical tradition as “always already” rooted in projects of future-envisioning. The open mic event was an iteration of this practice, in which all who came to the space were asked to participate, blurring the line between performer and spectator, between teacher and learner. Lykes, a black queer artist, activist and policy analyst from New York City, N.Y., combines art-making and training workshops to envision and realize spaces of anti-oppression. Lykes is co-chair of the board of directors for BYP100 (Black Youth Project 100), a national member-based organization of youth activists that creates freedom and justice for all black people, and focuses on “transformative leadership development, direct action organizing, advocacy and political education using a black queer feminist lens.” Lykes is also the co-founder of the Keeping Ballroom Community Alive Network, which encourages trans and queer people of color – emphasizing the long history of radical organizing in the house and ball community – to create new possibilities of self-care and self-determination. Lykes recently released a collaborative album he directed, The Black Joy Experience, made by young black organizers of BYP100. The album weaves together song, Black Lives Matter chants and spoken word that center on and celebrate blackness, femininity, youth and queerness. After the informal workshop session, students began performing their own dance, song and spoken word pieces, experimenting with body movement and sound creation. Merudjina Normil ’19 performed a spoken word and dance piece that wove together the sounds of rain with body movement, and some in the audience were moved to sing while she flowed across the stage. Quess Green ’20 danced to his own choreography, while the audience hyped him up (and he, with the fresh audacity of his movements, hyped right back). Gibson’s poetry performance bitingly named what it means to be an unapologetic black femme in an anti-black misogynist world, and Isaiah Blake ’21 performed a poem about food and family, followed by a somber and spine-breakingly beautiful rendering of Simon & Garfunkel’s “Bridge Over Troubled Water.” Other students experimented with sound and words, and it would not be an exaggeration to say I was mesmerized by everyone who got on stage. Somewhere in the middle of the performance, the food – from La Fogata in Pittsfield – arrived, and everyone huddled around the table filled with platters of empanadas, arroz con pollo, frijoles, chicharrón and bottles of malta. 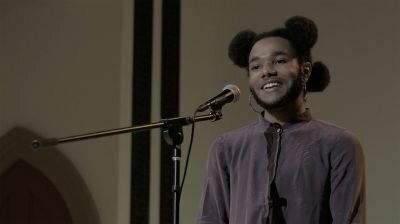 Afterwards, Lykes performed songs and spoken word pieces that centered on Afro-heritage, queerness, blackness and healing from historical and familial trauma. While playing guitar, or making percussive sounds with his body, Lykes brought the audience into the singing and chanting with him. His voice was at times indistinguishable from that of the audience as he sang, “I love the color of my skin / ‘cause it’s the skin that I’m in.” At times, the audience and Lykes engaged in a call-and-response refrain, stating, unequivocally: “anti-blackness exists,” a reminder of the gravity – the sheer life-and-death stakes – of the work being done in the space to make black joy. Lykes then invited students from the WGSS 380 course to help lead the audience in a polyrhythm, where students sang weaving melodies. To imagine and enact spaces of young queer black joy is not only radical but visionary. Given the current national context – where white supremacy is condoned daily and propagated by “elected officials,” and the surge in racist hate crimes is a horrifying embodiment of the national discourse – it seems that survival can only be defined in the negative, by what people are surviving against. At the College, white supremacy, heteronormativity, homophobia and transphobia are more veiled, in that students and faculty bear the consequences of what the College does not provide in terms of support and accountability. But BYP100, among other organizations that center queer black youth in their political action, insists on the importance of joy and healing as gestures of anti-oppression in themselves. Community organizing is about defining and redefining what we want to be for, all while waking up every day and facing the way American institutions continue to challenge people’s right to exist. The morning before the event, Lykes said that “white supremacy has taken something away from all of us.” Thus, imagining and creating spaces for black queer joy is a way of remaking the world we live in, without waiting for institutions to catch up.